Det finnes de som mener at »Little Sister« er Elvis Presleys fineste tre minutter. Nå er gitaristen som spilte de magiske riffene død. Vi har fanget opp denne artikkelen av Peter Cooper fra Nashville-avisen The Tennessean. 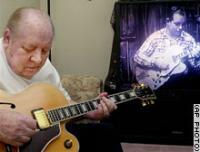 Hank »Sugarfoot'« Garland, whose short, spectacular career as a Nashville guitarist led greats including Chet Atkins to call him »the best who ever played here,« died Monday evening of a staph infection in Orange Park, Fla. He was 74 and was revered as an innovative force in country, rock and jazz music. Known for writing and performing a fleet-fingered instrumental hit he called Sugarfoot Rag, Mr. Garland also contributed the famous kickoff to Bobby Helms' Jingle Bell Rock, the tough and swampy riff throughout Elvis Presley's Little Sister and the tremulous opening notes of Patsy Cline's I Fall To Pieces. Mr. Garland was among the standout players in a group of session musicians called »the A-Team,« a collection known for sophisticated arrangements and virtuoso chops. The A-Team's musicianship shaped and defined the »Nashville Sound,« which helped country music emerge from rural roots and find national and international popularity. Not satisfied with his late-1950s standing as Nashville's top session guitarist, Mr. Garland also became a force in jazz music, recording an album called Jazz Winds From A New Direction that inspired guitar players, including pop-jazz star George Benson. With Jazz Winds' release in early 1961, Mr. Garland seemed primed to become the first superstar jazz player to emerge from the Nashville studio scene. But on Sept. 8 of that year, an automobile accident left him with brain damage and insufficient coordination to ever re-emerge as a musician. Hank Garland the human being died Monday evening, but Hank Garland the guitarist was put to rest more than four decades ago. Born just outside Spartanburg, S.C., Mr. Garland was discovered at a Spartanburg music store by Grand Ole Opry performer Paul Howard. Shortly after his 16th birthday, Mr. Garland moved to Nashville and began a remarkable career that found him recording with Presley, Brenda Lee, Hank Williams, Eddy Arnold and others. Mr. Garland may have been the fastest guitarist in Nashville, but he was also a master of melody, harmony and tone. Though his recording career lasted less than a decade and a half, his musicality was such that Nashville's best-known guitar hero, Chet Atkins, said in 2000 that Mr. Garland was Music City's best-ever guitarist.